The continental-mainland portion of the Canadian Province of Newfoundland and Labrador, Labrador is the largest and northernmost geographical region in Atlantic Canada. It occupies the eastern part of the Labrador Peninsula, the large extension of Eastern Canada that includes most of the Province of Quebec. Labrador is bordered to the west and the south by Quebec and also shares a small land border with the Canadian territory of Nunavut. Though 71 percent of the province’s land mass it only has 8 percent of its population, approximately 30,000. That was a bit of a stunning statistic when we first heard it – we live in a village in Ontario and, coupled with the nearest town to us, our local population exceeds that of Labrador. 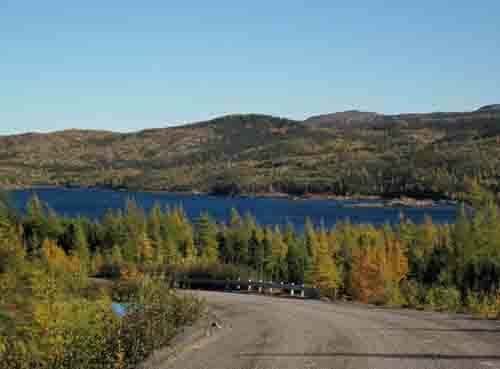 The Trans-Labrador Highway is a challenge to most drivers due to its remoteness as it cuts into unparalleled wilderness. The possibility of mechanical breakdowns in the middle of nowhere and seasonal persistent bloodsucking insects, bone-chilling rain and moose hell bent on auto suicide make an expedition all that much more exciting. Driving its full length of about 1200 kilometres is truly a Great Canadian Road Trip. Before we left absolutely everyone asked, “Why are you going to Labrador? What is there to see or do there?” I couldn’t answer then but now I can. In a lot of ways the most definitive answer is, “Nothing!” And that in itself is the real essence of venturing there. We wanted to get away from a world that is often a madhouse; have time to relax and enjoy just being. We were not distracted or annoyed by traffic at all – as a matter of fact as I looked out the windshield of the car driving along the 401 as we approached Toronto on our way home I commented there were more cars in my immediate field of vision than we had seen all the time we were on the road in Labrador. 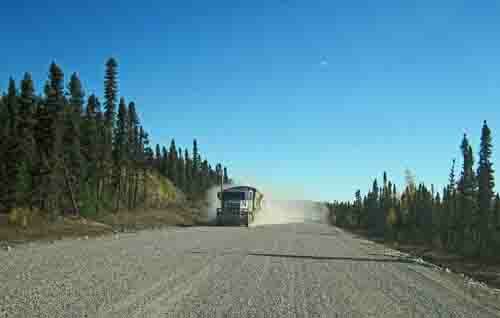 At times it’s the loneliest road in the world and still only half of the distance is paved – there are about 600 kilometres of gravel road remaining. I refer to it as gravel but that is not completely accurate. If the truth be known, gravel is paradise; if it’s thick and level the ride is smooth and pothole free. You have to be careful you don’t surf right off the road into the bush but kilometre for kilometre it is far preferable to the minefield of potholes that is its hard-packed dirt cousin. 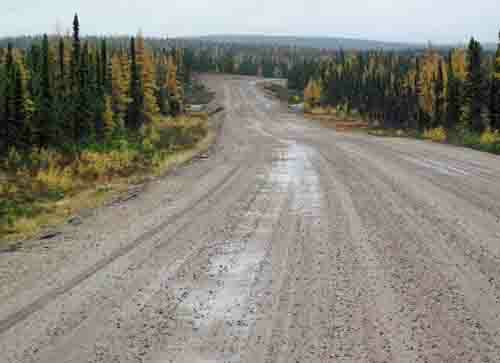 The road in to Port Hope Simpson from the west was an astounding feat in our van. As we approached the section under construction my only thought was “This can’t be the road can it? 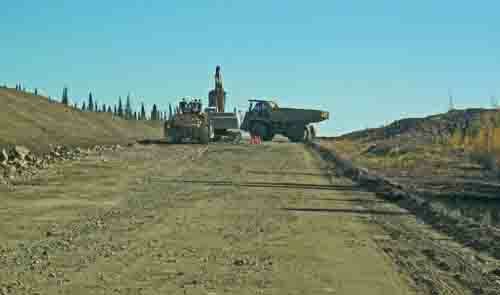 They’re building it as we’re driving on it!” It’s not a road at all, it’s a 300 kilometre pothole. We’re just waiting to see what falls off the van first. I think it’s going to be one of the doors – or perhaps the whole van will just break into two pieces and fall down onto the road. Large earth movers and rock crushers were perched on the side of the road manufacturing the gravel from boulders trucked in from nearby quarries; nothing like a fresh layer of shards of razor-sharp rock to drive on. As if the van disintegrating as we drove wasn’t enough; now I had to worry about tires being sliced as well. We have one spare but there are four wheels on the road surface. The monster dump trucks had wheels the size of buildings and they were surely creating more potholes than they felt. We on the other hand felt every one as more rust and metal bits were rattled and bounced off our vehicle, just waiting for something important to be a casualty. The construction delay, which probably accumulated a sum total of 10 minutes all day, was far more palatable than 30 seconds on our gridlocked Ontario highways. 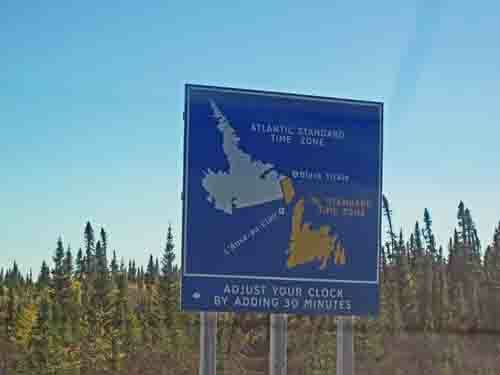 We crossed into the Newfoundland time zone and lost another half hour – why is it half an hour? I can’t even say I’ll never get it back because I will when we get off the ferry in Nova Scotia. We were still a little early for arrival at our hotel so we decided to take the 100 kilometre detour to Pinsent’s Arm. We were not likely to get as beautiful a day later and the road in was quite good; as a matter of fact, the last section from Charlottetown to the Arm was one of the best roads we encountered on our whole trip. The community of Pinsent’s Arm was historically the winter place for the fishing communities of Square Islands, Triangle (geometry anyone?) and other stations at the mouth of St. Michael’s Bay but was settled permanently in the 1950’s. It is believed that the community and Pinsent’s Island to the east were named for an early fur trader named Andrew Pinson. Is this a case of lost in translation or am I missing something with this name? At a population of 55 Pinsent’s Arm relies on the services of nearby Charlottetown (population 350) for schooling, postal and medical services. Pinsent’s Arm was at the end of the highway so that was reason enough to go there. 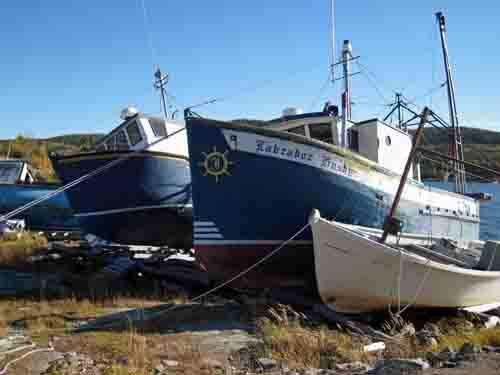 It seemed a haven of derelict boats and it was difficult to tell which ones were abandoned and which ones were dry-docked as none were in the water. We walked down to a rocky beach where a young couple and their son were exploring. Mom approached us with a hat full of partridge berries and offered them to us. The gesture was so typical of people in this part of Canada. The family was visiting from nearby Charlottetown – out for a short getaway, leaving the city behind. We had TV and internet everywhere we went but were not inundated with all the bad news – maybe we just chose not to look at it. That alone made it worth getting away. On the road in Labrador we were often the only car for kilometres and sometimes hours. Labrador is one of Canada’s few remaining wildernesses and we are blessed to have seen it in that state. As the road is improved and we are treated to “progress” all that will disappear. We truly did and saw things that few people get to and that made our month away very special.